On Monday, the hopes of illegal immigrants in New York looking to receive financial aid for college were dashed when the State Senate rejected the DREAM Act, by a close vote of 30-29. The bill needed 32 votes to pass, but two Senate seats are currently vacant, and two senators didn't participate in the vote. The bill was brought to the floor Monday by the Senate's ruling coalition of breakaway Democrats and Republicans, a move that DREAM Act supporters say was intentional. In fact, Assemblyman Francisco Moya of Queens, the bill sponsor, is calling it a "gutless move on the part of the Senate leadership," who clearly took advantage of the two vacant Senate seats to squash the bill. The Assembly passed the DREAM Act earlier in 2014, knowing its chances of survival in the Senate were up in the air. Bill supporters were slowly but surely putting pressure on key senators to changes their votes to "yes," but felt they needed more time to ensure they had all the votes needed for passage. Even one more day could have made all the difference, especially since only two more "yes" votes were needed. The DREAM Act proposal includes a $25 million budget appropriation that would expand the state's Tuition Assistance Program for undocumented immigrants enrolled at public or private colleges. According to a report from Comptroller Thomas DiNapoli, 8,300 students attending CUNY and SUNY would qualify for the tuition assistance. DREAM Act supporters say illegal students shouldn't be punished simply because their parents brought them to the U.S. illegally, while opponents say the state needs to make college affordable for those who live here legally. Queens Democratic Sen. Michael Gianaris told Huffington Post that the vote "made a mockery of a very important issue." Moya, along with Senate bill sponsor Jose Peralta, are calling on Gov. Andrew Cuomo to push for the DREAM Act to be included in the final state budget, which is due at the end of March. 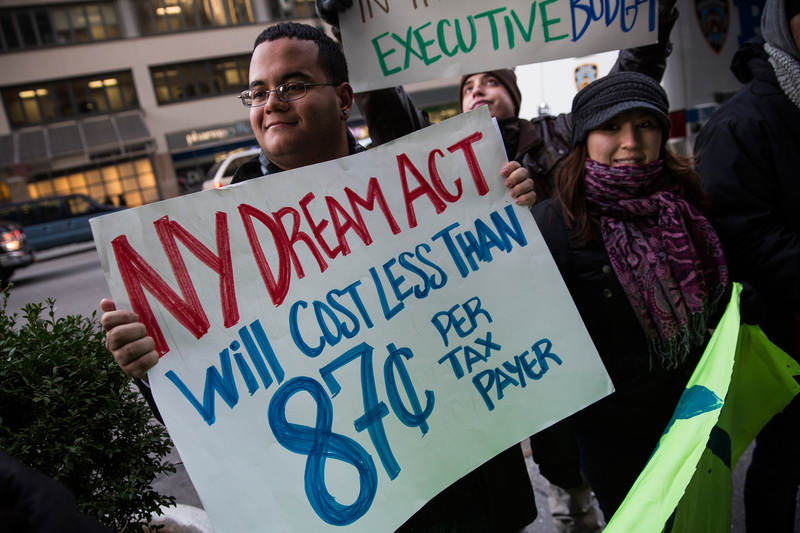 Earlier on Monday, Cuomo had called the DREAM Act a priority for the state. Buffalo Republican Sen. Mark Grisanti, who voted against the bill, told the Huffington Post that he "cannot justify spending tens of millions of taxpayer dollars annually to pay for tuition for illegal immigrants when so many law-abiding families are struggling to meet the ever-increasing costs of higher education for their own children." To date, the DREAM Act has been approved in four states: California, New Mexico, Texas, and Washington.